If you enjoy arcade kart-racing games, do yourself a favor and download Sonic & Sega All-Stars Racing [$1.99] by Sega. There’s currently an introductory price of $1.99 which ends on June 25th, when it increases to $4.99. The game is universal, so it runs on iPad and iPhone. The console version came out last year, so you may already know this game involves racing, drifting around corners and shooting opponents. 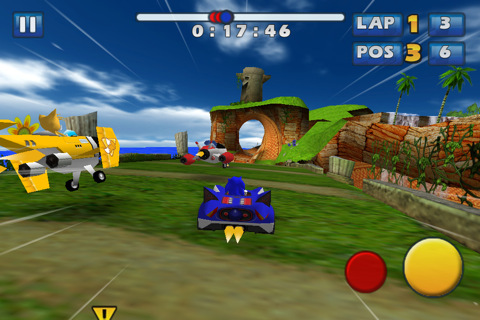 It’s a playful light-hearted game, rather than a racing simulation and the characters and courses are based on Sonic and Sega game-worlds. Seriously, if you like Kart racers, just go download it. Need some more convincing? Alright. This game opens with a fan service filled animated intro to introduce the Sega characters, after which you create a Sega driving license for yourself by choosing your name, character and flag. You can create multiple drivers licenses, allowing more than one user to have a profile for the game. As you race, “Sega Miles" are added to your license, which help you to unlock courses or characters. You get to choose which order you unlock the levels or characters in. Right from the start, you’ll be impressed with the way this game is presented. Even the menu systems look great. And there’s plenty of gameplay options. There are four single player modes, including 25 missions to unlock, 3 grand prix cups to win (with easy, medium and hard modes), plus single race and time trial modes. For ‘single race’ you can specify the number of racers, laps, difficulty and whether power-up items and gimmicks appear. For ‘Time trial’ there are ghost racers to beat. But here’s the best part: – there’s also multiplayer modes. You can race or battle against one friend locally via bluetooth, or as four friends online. A battle involves finding weapons and eliminating opponents by attacking them three times. Many games with online multiplayer initially have trouble with having a player base to be matched with for online games, but on day one, in my first attempt, I joined a multi-player quick-match within seconds. Let’s examine the characters and courses. The 10 Sega characters in this game include names like: Sonic, Tails, Dr Eggman, and Ryo Hazuki. Each has their own vehicle with different attributes for speed, acceleration, handling and turbo. The vehicles include car, monster truck, bike, plane and even a banana vehicle. There’s enough variations for you to pick a favorite vehicle which matches your preferred handling preferences. There are 15 courses, such as Whale Lagoon, Icicle Valley, Lava Lair and the Sewers. The tracks have turbo patches on the ground and curved loop-the-loop tracks, which will be familiar to anyone who played Sonic the Hedgehog. There’s jumps and drops too, but If you fly off the edge of a cliff, you’re teleported back to the track. Each course is detailed and quite distinct from the others, with lovely HD graphics, for example Whale Lagoon features waterfalls, split tracks and a whale/shark/dolphin/fish-like thing jumps out of the water. Once you’ve got a license, a tutorial is provided, to explain the controls. There’s two control schemes available– The default uses auto-acceleration, with tilt movements to steer, a brake button which reverses (quite quickly) when held down and the frequently used “drift" button for sliding around corners. The alternate scheme uses touch controls for steering, but instead of left and right buttons, there’s a slider. Personally, I’m not a fan of slider controls, so I preferred the tilting option. There’s a setting for “Steering Assist" which the pros may want to turn off and tilt-sensitivity can also be tweaked in the settings. 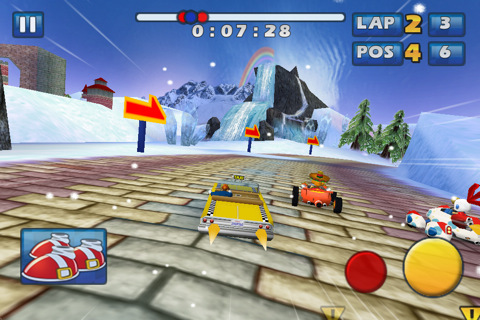 The racing gameplay is build heavily upon the idea of “drifting" around corners. The more you drift, the bigger the speed boost you receive, which also helps to smash through obstacles on the track. There’s plenty of power-up capsules to collect, such as turbo, mines, shield, the mega-horn, heat-seeking rockets and ‘K.O gloves’ which bounce of the walls and hopefully hit your opponent. Some of the items are more comical, such as a power-up which transforms your vehicle into a large rolling ball, crushing other vehicles, or the rainbow item which causes your opposition (or you) to be temporarily blinded by beautiful, yet track-obscuring, colors. Each Sega character also has a special “all-star move" to unlock. With all these features, Sonic & Sega All Stars Racing is an easy game to recommend and it’s likely to climb the charts. People are loving it in the forums, where it’s already being crowned by forum members as the best kart-racing game on the App Store. Nice work Sega… Now, how about those emulator games?